(Phys.org)—Chinese based Guangzhou OED Technologies (makers of O-paper displays), in collaboration with another unidentified Chinese company has announced that they have developed what they are claiming is the "the world's first graphene electronic paper." In the announcement, the companies also claim that the product is a breakthrough that will bring e-paper to a new level. 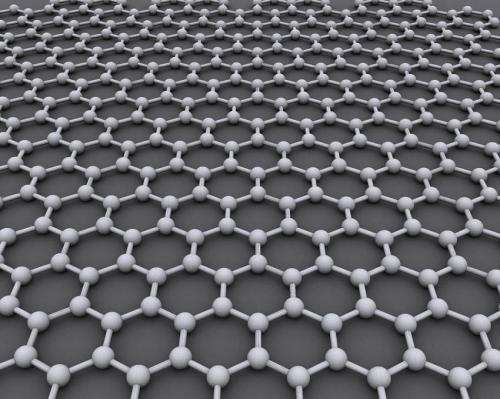 Graphene, is of course, a single layer of carbon bound together in a hexagon pattern. Its impressive conductivity properties have made it the subject of much research by many individuals and organizations around the world over the past few years. Now, in this new effort, the group at OED claims to have developed a graphene material that is suitable for use in making e-paper. Doing so, they also claim, allows for creating screens that are more bendable and that are also brighter because they will be able to display light with more intensity. They also suggest that because the end product will be carbon based, it should be cheaper to manufacture than current e-paper products which are based on metal indium. Thus far, the new material has not been publicly demonstrated, and it is still not clear how available products will be even after they move into production next year as promised. Despite advances, such as those made by engineers at MIT last year, it is still not clear if it will be possible to mass produce such a product in a defect-free manner. Also not clear is if the new material will be sold in partnership with other companies with a high profile in marketing e-readers, such as Amazon's Kindle device. If the new e-paper proves to be as advertised, it could mark a major shift in e-reader technology—graphene, as is noted in the announcement, is a mere 0.335 nanometers thick, which would mean thinner displays, less weight, more durability and of course, much more flexibility. It seems possible that such a material could usher in a paradigm shift—from e-readers that look like tablet computers, to e-paper that looks like old-school paper, but is animated, similar to that seen in the Harry Potter movies. Or, as also mentioned in the announcement, it could lead finally to wearable smart devices. smart scroll - [put in company name] Scroll (Samsung Scroll would sound cool!) - Scroll(TM) - esheet (which offers disgruntled reviewers/customers the opportunity to go, "Eeee...sh*t!") - smart paper - [put in company name] Paper - Papr / The Paper / zPaper(TM) - smart parchment...or (God have mercy on us) iPaper / iPap / iParch! P.S. Entrepreneurs-in-the-making: you're free to borrow any of the above...no IP intended at my end!